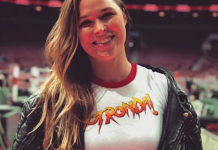 Last night, amid the exciting WrestleMania 34 festivities, former UFC women’s bantamweight champ Ronda Rousey partook in her first WWE match, teaming up with fellow Olympian Kurt Angle to thrash HHH and Stephanie McMahon. Leading up to her WrestleMania debut, Rousey had throngs of doubters and naysayers, who felt she was destined to disappoint in the squared circle. In the end, however, she silenced these doubters in the most emphatic way possible, performing with dazzling speed, athleticism and charisma throughout her match. 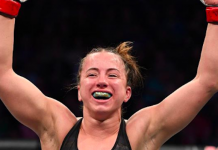 Unsurprisingly, many members of the MMA community tuned in to watch the former UFC women’s bantamweight champ do her thing in the ring. After the event, many of these fighters and pundits took to social media to share their thoughts on Rousey’s performance and congratulate her on her tremendous success. Here are some of the best reactions to the former UFC champ’s WWE debut. Did you watch Ronda Rousey’s riveting WWE debut at WrestleMania 34 on Sunday night? If so, what did you think of her performance? Join the conversation in the comments section below!